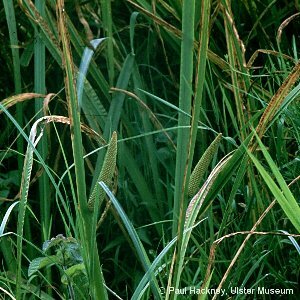 Originally introduced to the gardens of Sir John Rawdon at Moira and planted in lakes at Hillsborough and Montalto but later spread from Moira Demesne into the Lagan Canal. 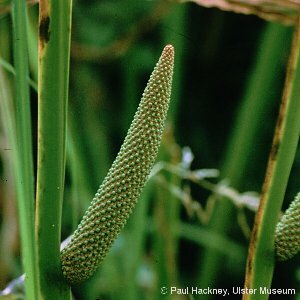 It was first noted in the Lagan canal in 1866 and in 1888 was so abundant that the leaves were used for bedding cattle. These days it is almost entirely restricted to banks of the Lagan Canal from Broad Water, via Aghalee and Annaghdroghal to the Lough Neagh shore at Ellis's Cut. The leaves resemble those of yellow flag, but have strongly waved margins and smell of tangerines when bruised. The species was introduced into Europe by 1557 and naturalised in England by 1660 - native to southern Asia and western N America. Elsewhere in Ireland only on the R. Boyne. 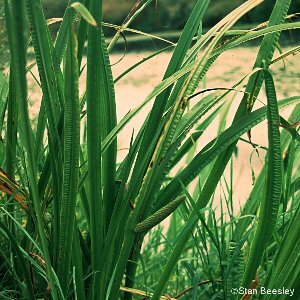 All names: Acorus calamus L.